You want to own a rental property, and there are plenty of reasons why. You want the added income that comes from renting out a home or a vacation property. You want a tangible investment, one that appreciates in value over time. You want all these things, which is why you want to work with the non-recourse loan lenders at First Western Federal Savings Bank to get a rental property loan to make this happen. But as you start thinking about your future rental property, you’ll need to figure out if your rental is going to be for vacation purposes, or long-term tenants. Our non-recourse loan lenders are here to help. Take a look at which option might be better for you and your financial portfolio, and get your application ready today for First Western Federal Savings Bank to review! A one-bedroom in a big city might be rented by a tenant for about $1,200 (though this varies greatly by city) a month. That same one-bedroom could be an Airbnb for $100 a day, which, if rented out every day of the month, would generate $1,800 more than if leased by a tenant. Even if you only had travelers choose your vacation rental property for 15 days of the month at that price (which is unrealistically low), you’d still make more money than having a long-term tenant. Do you want to set a two-night stay minimum? Do guests need to check out at a certain time? Do you want to have a say in how your place is decorated? A vacation rental property allows you to have more control than if you hand over the keys for the next year to a long-term tenant. For some people, this is highly preferable and gives them the peace of mind they need. People staying a night or two at your vacation rental property are going to be inclined to treat it as they would a guest’s home. They know they’re liable for certain things, they’re staying in town temporarily, and it’s usually not enough time for people to get too comfortable — or at least, comfortable to the point of where things can be damaged in the process. When long-term tenants stay in your property for a year or longer, they’re truly making this place their home. Art and posters will be nailed into the walls, the oven and appliances are most certainly going to be worse for wear at the end of their lease, and any other accidental things — from scratches on the door to holes in the wall — are going to accumulate over their rental period, and cost you later. A vacation rental property requires more upkeep on the day-to-day basis, but the overall damage is unlikely going to be as bad as leasing out to a renter. After your vacationers leave your property, you immediately need to get it ready for the next set of guests. This includes intense cleaning, laundering the sheets and bedding, and getting everything perfect for your next guests. Whereas tenants are responsible for their own living situation, all of your traveling guests are going to expect a perfect setup each and every time — and will know instantly when something’s not as clean or prepared as it should be. Some people make an entire job out of managing their vacation rental property, because it’s that much work to upkeep a vacation rental property. Others work with a cleaning company to take away some of the responsibility, which can be convenient, but also means paying additional fees. No matter where a tenant rental property is located — in a city, a town, or a suburb — there will nearly always be someone looking to rent your property. For a vacation rental property, there truly is something to be said for location. While it’s not necessarily the only thing factoring into why people would choose your vacation rental, it does make a huge difference. A beachfront house or a beautiful cabin in a mountain town will likely experience more traffic than a house in the suburbs of a less-than-traveled-to city. That mountain cabin might be great in the summer and fall, but nearly impossible to travel to in the winter or spring — or simply not be what the majority of vacationers are looking for when they’re trying to escape the depths of the cold season. With a vacation rental property, there’s a much higher chance that you’ll experience an off-season, which would mean plenty of days where your property’s not generating the revenue you’d like to see. 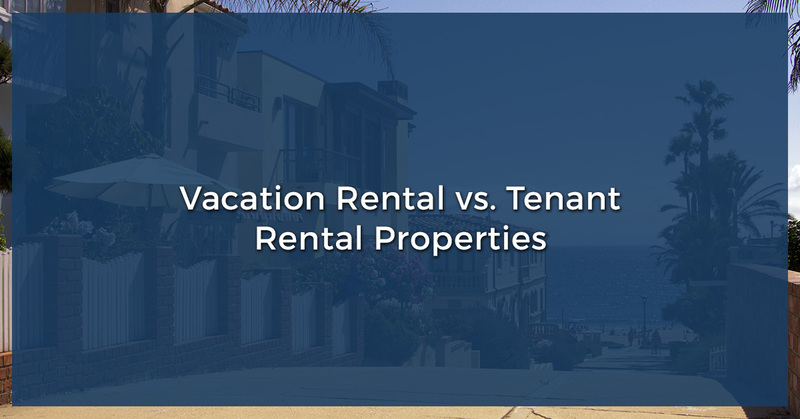 Vacation rental properties do have higher costs per day, but in places that only get consistent travelers for several months out of the year, the difference in profit from a tenant rental might not be all that significant. Plus, tenant rentals are rented out on Mondays-Thursdays — vacation rentals likely see a decline in number of visitors on weekdays. In our next blog, we’ll cover some of the pros and cons that come from a long-term tenant rental. Our non-recourse loan lenders want to help you make informed decisions when it comes to your rental property, regardless of whether it’s for vacation or tenant purposes. Contact First Western Federal Savings Bank to get started.